The Hypocrisy of Alcohol vs. Drug Laws! Marijuana is illegal in most of the world, while alcohol is legal, despite the fact that alcohol is a far more dangerous drug than marijuana in every way. People consider marijuana to be a dangerous drug, while they think of alcohol as being a fun beverage. 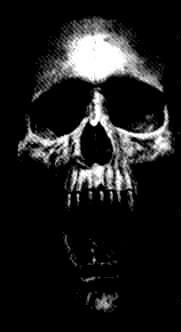 They consider those who sell marijuana to be drug dealers, the scourge of society who should be hunted down and imprisoned, while those who sell alcohol (wine makers, grocery stores) are viewed as respectable citizens. Logically speaking, it should be the other way around. Alcohol tends to make many people aggressive, leading to a variety of violent crimes, while marijuana does not. Alcohol is a central nervous system depressant, and leads to a serious loss of coordination and motor skills. 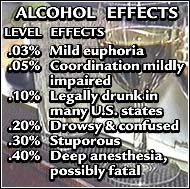 At larger doses, alcohol renders one completely unconscious. 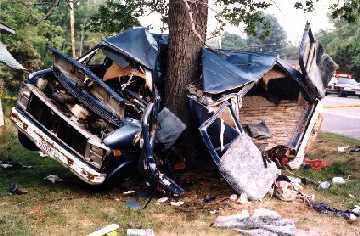 Drunk drivers cause enormous numbers of automobile accidents and deaths. Marijuana is not a central nervous system depressant, and while one probably shouldn't drive while intoxicated on anything, it simply does not cause anywhere near the loss of motor control that alcohol does, and is only a fraction as dangerous as alcohol in terms of driving. And, a large enough dose of alcohol can and will kill you, while the same is not true of marijuana. But people are looking at this based on their feelings. Marijuana feels like a drug to them. It's illegal, isn't it? Alcohol feels like a fun beverage. It's legal, and socially acceptable, so it feels ok, so it must be ok. So the same cop who arrests someone for possessing Marijuana, can LEGALLY go home and get plastered on Jim Beam or Jack Daniel's alcohol. All of this is illogical and stupid, and typically human. It is tragic! "The National Highway Traffic Safety Administration's (NHTSA) position on the relationship between blood alcohol concentration and driving is that driving performance degrades after just one drink." 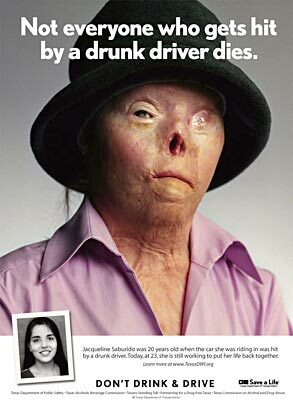 Which naturally raises the question... why should anyone be allowed to drive legally after drinking even one beer? I mean, if our government is telling us that drinking even ONE BEER degrades people's driving performance, then why does the same government allow people to drink 2 or 3 beers (which will result in a BAC .08)? Actually, a driver can be impaired with a U.S. blood-alcohol level as low as .03. When you drink alcohol, it goes straight from the stomach to the bloodstream. Alcohol can be detected in the blood as fast as five minutes after drinking, and its effects -- most obvious in the central nervous system -- peak in about 30 to 45 minutes.